This month I would like to highlight a very special up and coming authoress, Belle, who is currently working as a Guide Dog. I thought it would be fun to have you hear her “tale” in her own words! Belle, thank you so much for taking time out of your busy schedule to talk with me. I know your fans are just drooling to hear from you about your exciting adventures. Belle: “Yes, please. I do have a very busy schedule, you know. We are planning a trip to Disneyland so I can visit my old friend Pluto. 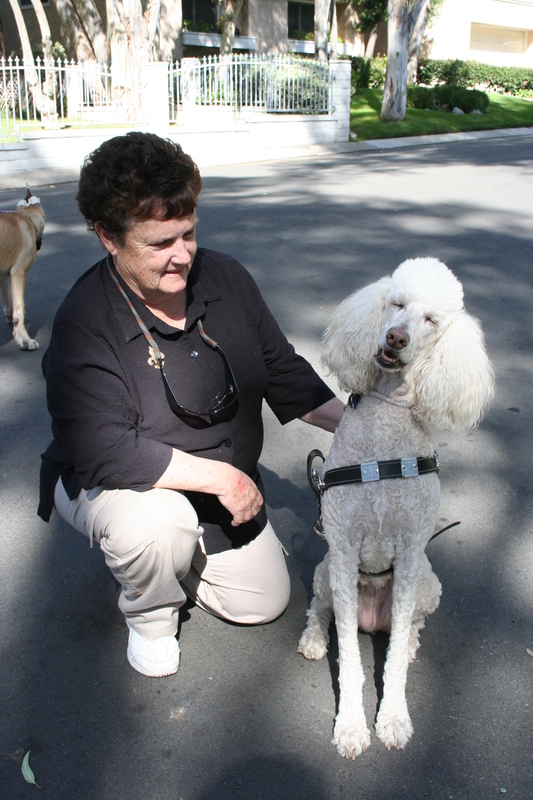 Anyway, I was a free spirit, floating around the universe, when, one day, I got “The Call.” Some veteran guide dog user realized how Poodles would be the perfect service dog. It certainly doesn’t take an Einstein to recognize I don’t shed; I certainly do not carry the “dander” like most other dogs; and I am definitely smarter than your average canine. That night, I claimed my space on my new owner’s bed with a nice, soft pillow for my gorgeous, curly head. The Shepherd moved to the floor. I had to put her in her place right away. Little did I know, she would be my mentor for the next couple of years. Even though I have developed an infinite passion for guide work, I never go out without my hair looking just perfect, as you see in my photo. After 18 months of mimicking that klutzy old Shepherd, my owner contacted a school that trained guide dogs. After stalling for several months, the school determined, “We don’t do Poodles.” We tried to enlighten them as to the “paws-ibilities” and how wrong they were but they refused to listen. So I decided to raise a small family of six, while the humans got their ducks in order. A year later, I was spayed, and entered Guide Dogs of America. Four trainers had to “test drive” me before they recognized how they had overlooked my excellent qualities to be a perfect guide dog. Five months in “doggie college” earned me the proud distinction of graduating, tops in my class. It is the first time that a blind guide dog user has raised and trained a puppy to be a guide dog and then went to the school to be awarded her puppy as a fully “bone-fied,” certified guide dog. But that is not the end of the story. Talk about the ultimate compliment! 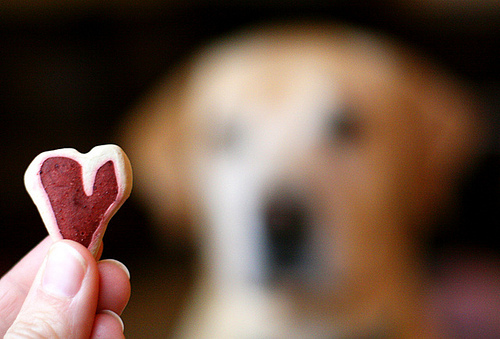 Most schools train Labradors, Golden Retrievers and some German Shepherds. Of these breeds approximately 45% drop out, or do not make it through to graduation. Humans do not realize what a stressful job this is! It is really “ruff.” But I am proud to report that out of 20 Poodles in the first class, 19 graduated with honors. Now, there is a waiting list of humans who will not accept anything other than a Poodle for their guide. I guess we showed them! I am proud to report that I have just completed raising and training another Poodle puppy for my owner, who intends to go to the school next summer and get her new guide. After all, I am now ten years old and “my dogs are barking.” I intend to retire and resume my position on the bed with my plush pillows to watch TV. So many episodes of Animal Planet and so little time! P.S. I have been known to eat steak. So, if you see me in a restaurant and want to buy one for me, you will need to ask my owner first, and, we will take it in a “doggie bag.” Whew, it took me a long time to train these humans how to do this! I would like to thank Linda Lueck for contributing this enlightening piece on Belle, a true canine hero! We’ve been pet sitting Mr. Murphy, Sam and Tiger long before Murphy was even born. Because they are so much fun to be with, we at The Best Pet Sitting often fight over who is going to do the pet sittings! This is why they are February’s Client of the Month! Mr. Murphy makes it quite clear what he wants, and we need to get to it immediately, and that is his belly rubs! His poor brothers, Sam and Tiger, always wait patiently while we attend to Murphy’s “first round of belly rubs” before they can get to their special time of kitty treats. Then it’s back to more belly rubs, his special food, and then more belly rubs. As far as Murphy is concerned, his kitty brothers just do not need any attention; it’s all about Murphy! We have to gently tell him that the kitties need love too, and he has to share his pet sitters with them. We usually get a big “sigh” from him as we then attend to the kitty needs he finds so silly, and a waste of valuable belly rub time! I don’t think I have ever had a dog that is so intent about this procedure, but we all certainly look forward to it! 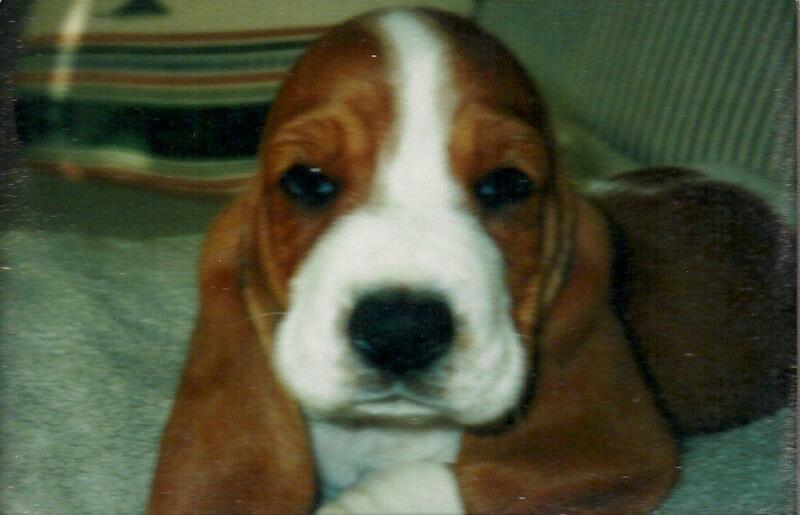 It’s fun to know and care for pets from their babyhood to old age. We form such a special bond, and this is so true with these three. 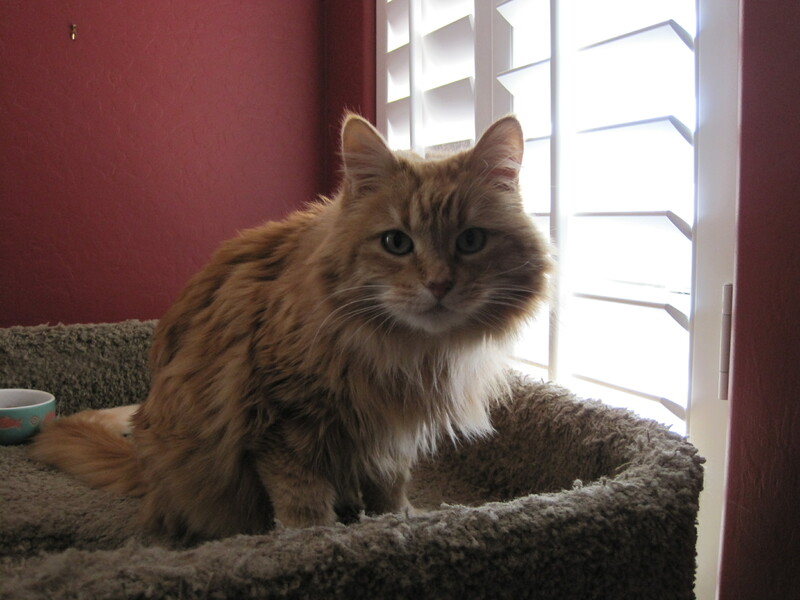 Unfortunately, this winter we lost their fourth sibling, Nimbus, and we do miss the “lump in the bed” very much. Nimbus would always hide under the covers! 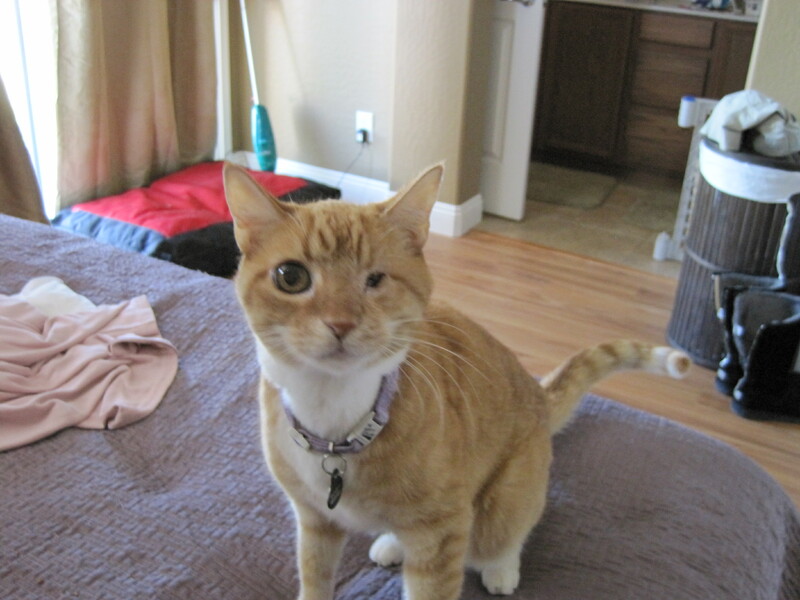 Pets like these guys remind us daily how lucky we as pet sitters are! You have to admit, to spend your days giving belly rubs and handing out kitty treats, is just the best job on the planet. Thanks to Murphy, Sam and Tiger for making my days brighter! Hope this makes you smile on this Wednesday! I think reading to children is very important, and so is having fun while doing it! 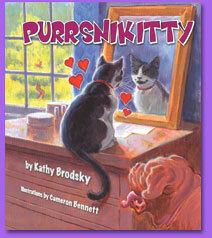 I came across author, Kathy Brodsky, and fell in love with her cute, animal-friendly books. They also provide the opportunity for interactive learning with your kids and the illustrations are down right adorable. If you’re a pet lover and looking for something fun to share with your kids, try one of the following books and be sure to read Kathy’s story. 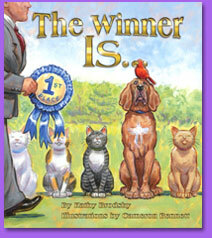 The Winner Is….is a funny story about a dog who tries to be someone else in order to win a contest. Will he succeed? Read the book and find out! 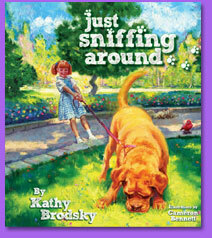 JUST SNIFFING AROUND is a wonderful picture book for dog lovers of any age. With a French Mastiff (a Dogue de Bordeaux) as the star, it describes the special qualities these incredible four-legged beings bring to our lives. Hardcover, printed in the United States, it’s in rhyming verse. Included are “Digging Further” questions for parents, teachers and the inquisitive child. “I’m a very special cat! I say that every day – I love myself so very much and always get my way.” Cat lovers young and old know these words ring true. They all agree, “Yes, that’s my cat!” If you love cats you’ll laugh and sigh with each page of text and illustrations of Purrsnikitty. 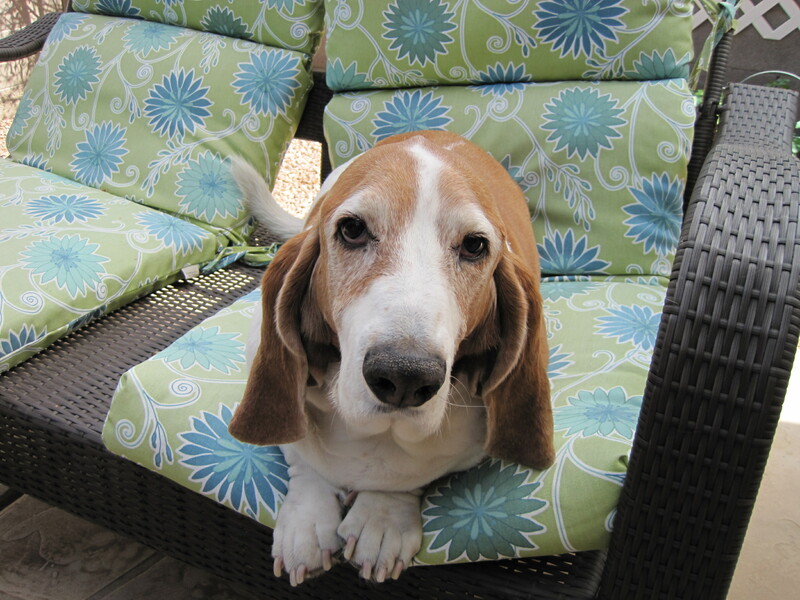 I had to share these cute pictures from The Pioneer Woman’s Love Photo submissions. 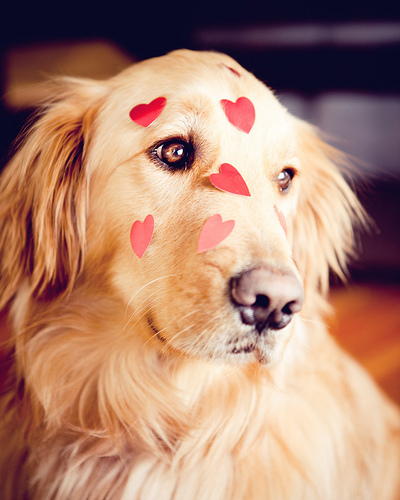 Nothing says love better than your pet. See more here. Hope it was filled with a big, wet kiss (or purr) from your loved ones. 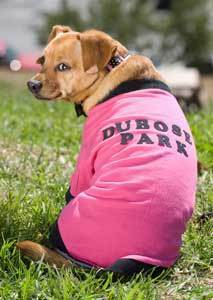 With the temps being in the low 30s and the wind crisp and strong, I was inspired to share with you Pooch Park Wear, the home of the finest custom t-shirts and hoodies for your most beloved pal – your dog! 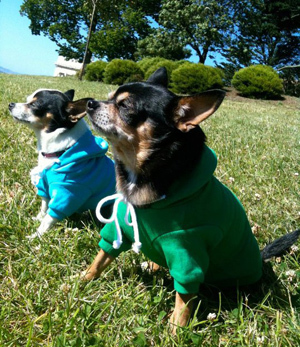 I’m a big fan of these little hoodies, especially when they start for as low as $15. They’re also great for keeping your little ones warm this time of year. Snow, low temps, wind chill – need I say more? Be sure to check out their Facebook page, too for fun contests, deals and more! They also have some cute T-Shirt and Hoodie ideas.